When my 12-year-old son decided to spend two weeks as a novice monk at the Wat Thai temple in North Hollywood, I hoped he would learn something about Buddhism. Instead he learned how to make a flamethrower out of a lighter and a can of Febreze. Say ?Buddhist monastery? and everyone pictures a strict, disciplined environment, full of structure and ritual. Wrong. You?re thinking of Japanese Zen Buddhism. Thai Theravada Buddhism is different. There are rituals and traditions; they?re just more, shall we say, flexible. Rather than a pious, silent retreat, the Wat Thai program is more like summer camp, except with orange robes and more chanting. 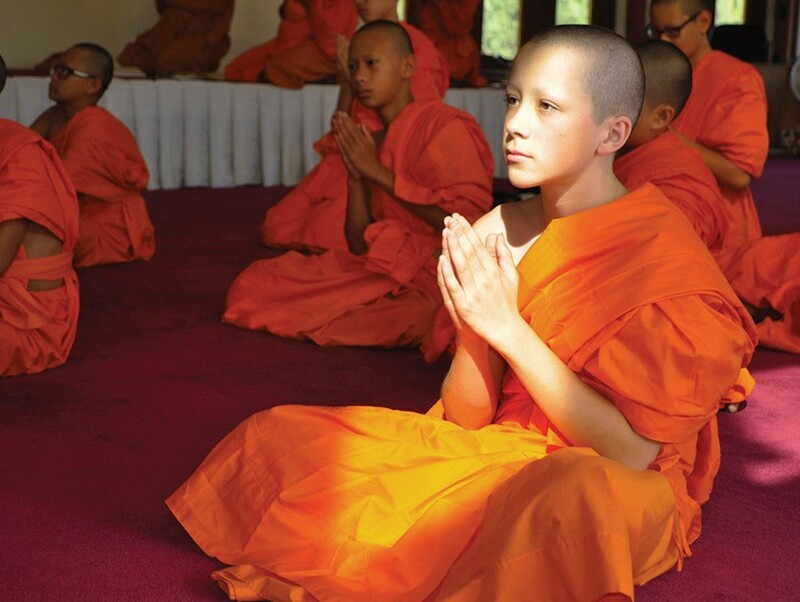 In Thailand boys are traditionally expected to spend some time as a novice monk, or nain. There is no particular age requirement for participation and no firmly prescribed duration?maybe a couple of weeks, maybe longer. Mai pen rai. That?s Thai for ?no worries,? ?it?s all good,? ?fuggedaboutit.? You hear that phrase a lot in Thailand. We?re a laid-back people?even by Southern California standards. The spiritual instruction at Wat Thai is at a soft ?Introductory Buddhism for Kids? level: Be compassionate, don?t hold grudges, cultivate calm. No need to burden young minds with Buddhism?s heavier concepts. For example: You don?t exist; you only think you do. Sure, you physically exist and stuff. But the you that is your collected self-concept isn?t fixed; it?s fiction. All the you-ness that makes you you isn?t really there. Yeah, it?s complicated. I?m half Thai and a Buddhist, and cultural heritage is important to me. So when my mom, whom my son calls Khun Yai, urged him to become a nain, I relented. I had to overcome my initial resistance to having my son take part in a program that would be closed to my daughter. The gender discrimination minuses were outweighed by the spiritual and cultural pluses. Parenting is so often a game of trade-offs between your ideals and your reality. My son initially balked as well, but Khun Yai convinced him. Neither of them will cop to this, but I suspect the decision had to do with the cash. Though monks renounce money, things are different for nains. After their ordination, nains are given alms from community and family members to ?make merit,? as encouragement for the boys and just because it feels nice to slip your kid a twenty when he?s been particularly good. It all adds up, and the kids come back loaded. Bald but loaded. I?ve been going to Wat Thai since I was a child in the ?70s, when the temple was a small house on a barren lot. Rushing to the foot of the large and slender Buddha statue, I?d light yellow candles and trios of incense sticks, eager to play with fire. I?d then sneak off to the monks? crowded quarters, allegedly to sweep but actually to snoop. The infinitely patient monks would simply smile. Thirtysomething years later, on a June morning, my mom and I headed to the temple to sign up my son. While she chatted with the monks, I struggled to understand the particular date my son should arrive, only to discover there wasn?t one beyond an approximate suggestion. What I thought was a language issue proved to be just more Thai-ness. Some boys would come earlier, some later. Mai pen rai. Not long after, my mom and I dropped off my son, his duffel bag, and his Nintendo DS. There was no formal ?intake? other than a 15-year-old nain who wandered in from downstairs. The teenager was staying for the whole summer and quickly took my son under his wing. He was friendly and likable, and my son was drawn to him immediately. They shouted ?See ya later!? and dashed off, not to be seen again until ordination day, the following Saturday. There are two things in life my son hates: being onstage and getting his hair cut. Today he would have to suffer both while wearing a white lacy gown with gold ribbon trim. Did I mention he?s a 12-year-old boy? It was ordination day at the temple?two days since I dropped him off?and I greeted my son near the foot of the stage, reorganizing my facial expression from pitying to nonchalant, with camera at the ready. My uncle and aunt arrived with Thai iced coffee and snacks, because you can?t do anything Thai that doesn?t involve snacks. The boys sat in a row of chairs on the ramshackle plywood stage, each holding a gold bowl. Monks handed pairs of scissors to the crowd, and we all lined up, stepping and snipping our way across the stage. The bowls filled with hair, and we?d passed the point of no return. My son could no longer escape, not with a lopsided mullet and a bald patch over his forehead. When it was over, the nains? heads looked like scrubby hills after a brushfire. Over a nearby planter, monks finished the job with disposable razors, bar soap, and a garden hose. Not even eyebrows were spared, and when I first laid eyes on my son?s pale, hairless head, I felt an uneasy jolt: So this is what he would look like if he had cancer. I shuddered. My seven-year-old daughter soon bounced over and gleefully shouted, ?Hey, you?re bald!? Her big brother shot her a murderous glare, until the other boys shouted the same thing at one another, followed by ?So are you!? They were bald, they were wearing lace dresses, they were missing their eyebrows, but camaraderie made it all OK. After a celebratory feast that included everything from curries to In-N-Out burgers, the boys stepped away to put on their orange robes and returned looking like real monks. Since the nains don?t eat anything after noon, my mom and I fretted about my son being hungry in the evenings. However, according to some liberal temples, milk isn?t considered eating, so nains are allowed to consume it to cushion their hunger pangs. We applied the following logic: Cheese is made from milk. So is yogurt. As are ice cream bars. You can see where this was headed. We returned from a trip to the market with dozens of miniature cups of H?agen-Dazs, but it seems other parents had had the same idea. Between the cheese sticks and smoothies, there was barely space to squeeze our treats into the temple?s freezer. During the next few days, I was blissfully unaware of what the boys were up to. Only later did my son reveal what really went down. The boys awoke before dawn each day to sweep the grounds. After that, they prayed, chanted, ate breakfast, prayed, chanted again, and ate lunch. Besides praying at 5 p.m., the only other scheduled activity was an evening shower. That gave them plenty of opportunities to explore. One day they noticed a large wasp nest under the temple?s eaves. Lumpy and misshapen against the ornate red-and-gold roof, it was quivering with activity. It was too high up to reach with a broom, which the live-and-let-live monks weren?t prone to do anyway. But the nains had different inclinations. They grabbed something handy and plentiful?yogurt cups?and threw them at the nest, sending a cloud of wasps exploding out of their condo and fuming toward the boys, who ran for cover, screeching and laughing. They decided to take their high jinks inside, where they?d be less visible. That?s why their 15-year-old de facto camp counselor decided to conduct his lighter-and-Febreze flamethrower workshop indoors, in one of the senior monks? bedrooms. Because it would be safer. Then there was the string cheese incident. During a game of football in which the ?ball? was a packet of cheese, a misdirected pass smacked a Buddha in the face. Terrified, the boys halted the game and ran to the foot of the statue for a frenzy of apologetic bowing. Not long after my son?s ordination, I stopped by the temple for a visit. When he came up the stairs, I was taken aback by his appearance. He looked stunning. No longer hidden by shaggy hair, his eyes and lashes stood out like dark, glittering jewels. I was transfixed by their beauty. It drove me mad that, since I was a female and he was a monk, per Thai custom I wasn?t allowed to lay a hand on him. No hugs, certainly no kisses, and I couldn?t even reach out and rub his stubbly, sandpapery head as I was dying to do. The following day a text arrived: ?Hey mom can I come home now. Like, this morning.? Then a second: ?Please.? What happened during the night? As I sped to North Hollywood, my mind raced with thoughts of Catholic Church-style scandals. I arrived to the raucous sound of boys playing tag. I pulled my son away to a smaller temple honoring Kuan Yin, the goddess of compassion, and he explained the problem. One of the younger kids was routinely shoving people around. Some boys used constant obscenities. Others pestered him to borrow his Nintendo. He complained about the food. ?It?s rice, rice, rice all of the time. And all we?re allowed to do is chant?it?s boring.? I was relieved. Of course being a monk is boring. That?s the point. I?d warned him that every meditation retreat involves a period of desperately wanting to flee, which you ride out. He couldn?t pack up and leave. We at least had to discuss it with the monks. In broken Thai I tried to explain. The 15-year-old was enlisted as the interpreter, and fortunately he?d witnessed the bullying. Still, I was frustrated that the adult monks weren?t intervening more. The head monk promised to rein in the misbehavior. He also reminded my son that another round of alms was coming up on Sunday. I offered to buy more comic books. My son agreed to finish out the week. His two weeks at Wat Thai ended in a moving ceremony in which he presented me with flowers and placed sweets in my mouth. Buddhism teaches that attachment to expectations is folly. When things don?t go as you imagined they would, you roll with it. Though I?d hoped my son would emerge with some new level of insight, in reality the experience largely consisted of the sorts of events that normally happen when you put a dozen unsupervised boys together?with or without hair. At first I felt disappointed in the loosey-goosey nature of the program, then realized that the only true problems were my own unrealistic assumptions. As always, the monks knew more than I did. They knew that the boys would resolve their conflicts and learn from the process. They knew that the boys were basically good and could help one another. They knew that staying up late, saying a few curse words, following every rule?none of it was all that important. Few things turn out as planned, and that?s OK. Mai pen rai.